Looking for a good book to celebrate April Fool’s Day? Pick up a fun read from Brianna DuMont called Famous Phonies: Legends, Fakes, and Frauds Who Changed History. This is the first book in a new non-fiction middle-grade series from Sky Pony Press that explores the underbelly of history, questioning whether the most noted figures are actually fakes. From Confucius to Pythagoras, Hiawatha to George Washington, Brianna “debunks many of history’s legends, both those who really existed and some who never did,” writes School Library Journal. 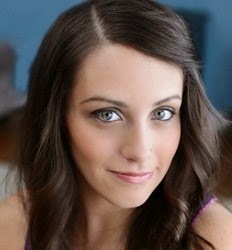 Read the interview with Brianna at AuthorOf.blogspot.com. In celebrating Women’s History Month, I thought it fitting to feature a non-fiction title about some seriously smart, capable, amazing women. Anna M. Lewis’s Women of Steel and Stone: 22 Inspirational Architects, Engineers, and Landscape Designers (Chicago Review Press, 2014) spotlights 22 women who were pioneers in their chosen, male-dominated fields. Spanning from the 1800s to current times, these stories explore the childhood passions, perseverance, and creativity that carried these remarkable women through daunting challenges all the way to the top of their professions. 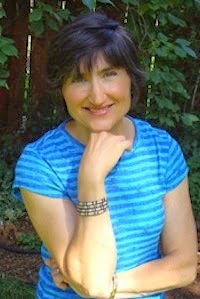 Read the interview with Anna over at AuthorOf.blogspot.com. Sometimes we come across books that we simply fall in love with. 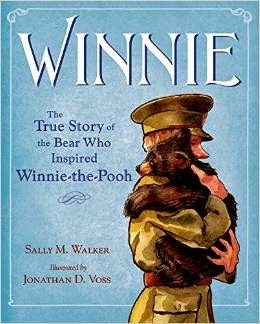 For me, I’ve fallen hard for the Sally Walker’s fascinating and adorable non-fiction title Winnie: The True Story of the Bear Who Inspired Winnie-the-Pooh (Henry Holt and Co., January 2015), gorgeously illustrated by Jonathan D. Voss. This is one of those books you leave out on the kitchen table so family and friends can pick it up. It lingers in the imagination, makes other writers smack their heads and wish they’d thought of it first, entertains and informs. Just like the bear on the cover, this book is huggable, irresistible. Sally, a Chicago-area author of fiction and non-fiction for young readers, including early readers, series, and a long list of non-fiction for older readers, has hit it out of the ballpark with Winnie. It tells the story of a World War I veterinarian named Harry, from Winnipeg, and the bear cub he meets and decides to buy. With detailed endpapers showing photographs of the real-life Harry, Winnie, and a boy named Christopher Robin, Sally takes readers through the sweet story of friendship, caring, and separation. Jonathan Voss’s warm illustrations enhance the story beautifully. Read the full interview at AuthorOf.blogspot.com. Who doesn’t love a daring adventure story when she sees it? And when it’s a non-fiction picture book? All the better. When it features a brave lass at the helm? Unbeatable. 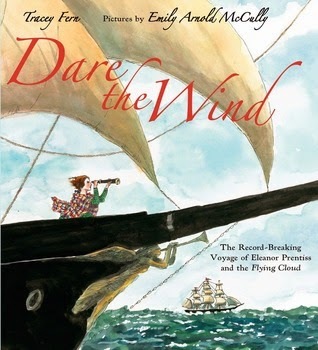 And there we have Dare the Wind: The Record-breaking Voyage of Eleanor Prentiss and the Flying Cloud by Tracey Fern and illustrated by Emily Arnold McCully, published only last month by Farrar, Straus and Giroux. Dare the Wind tells the story of young Ellen Prentiss, who was born “with saltwater in her veins.” Her father nurtured her interest in the sea, and Ellen learned navigate and sail on her own. When Ellen grew up, her love for adventure never waned, and her husband was given command of a clipper ship built for speed. With the Gold Rush on, Ellen raced from New York, around the tip of Cape Horn, and into San Francisco to stake her fortune. She not only navigated the clipper safely, but she set the world record for speed along the way. Question: You’re a Massachusetts gal, and so was Ellen Prentiss. Is that what drew you to her story? Could you talk about the “ah-ha” moment when you decided to write a book about this daring seafarer? 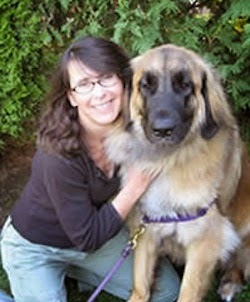 Tracey Fern: I’m always on the lookout for great real-life stories that feature a unique person mixed with a dash of adventure or discovery. My “ah-ha” moment came when I picked up David Shaw’s book, Flying Cloud, on a whim. I knew instantly that I had to write about Ellen. Ellen’s story – a young woman performing a traditionally male role, clipper ships, a race, storms – had it all! It was an added bonus that she was from Marblehead, Massachusetts, which is one of my favorite towns. I love walking the narrow, cobbled streets, imagining Ellen learning to navigate ships in the harbor. 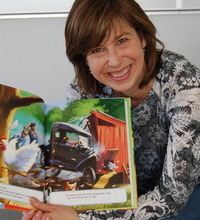 Read more of this interview over at AuthorOf.blogspot.com, where Kate Hannigan interviews authors of some of today’s best fiction and non-fiction, picture books to middle-grade. March is not only Women’s History Month, it’s also National Reading Month. So what better way to celebrate the two than with a gripping read about some remarkable women at a crucial time in America’s history. 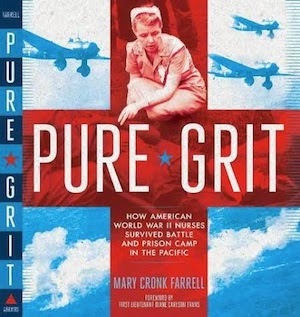 Mary Cronk Farrell‘s Pure Grit: How American World War II Nurses Survived Battle and Prison Camp in the Pacific (Abrams, February 2014) is designated for a third- to seventh-grade audience, but its appeal is much broader. I’ve talked about this title with parents and grownup friends as well as my own kids, and I simply cannot recommend this book enough. Not only does it detail the harrowing accounts of what these brave women went through, but it also looks at the frustrating treatment they endured upon return to the United States. Pure Grit tells the story of U.S. Army nurses who enlisted for peacetime duty during the early 1940s. When the Japanese attack on Pearl Harbor plunged the United States into World War II, their lives were turned upside down. One hundred and one American Army and Navy nurses serving in the Philippines suddenly found themselves treating wounded and dying soldiers in makeshift jungle hospitals. Told with page-turning urgency and illustrated with archival photographs, Pure Grit conveys the plight of these nurses struggling to help the wounded while bombs were exploding all around them. Captured by the Japanese as prisoners of war, the nurses went on to endure three years of disease and near-starvation. This is a part of American history I knew nothing about, and I am so grateful Mary Cronk Farrell devoted the time necessary to write Pure Grit. It truly is a story of sisterhood. Question: Pure Grit is incredibly well-researched. How long did this project take you from “ah-ha” moment to written manuscript. Can you talk about how you researched the manuscript and the people you connected with along the way? Mary Cronk Farrell: I worked on researching Pure Grit over a span of about five years, though I was not focusing steadily on the project. I made concentrated efforts for a few months at a time and then would need to turn my attention elsewhere, for instance I also researched and wrote Journey to the Top of the World during this time as well as writing two drafts of a novel and researching and writing an historical picture book manuscript. This worked well for Pure Grit because it took time to search for the nurses’ family members, other people I wanted to interview, and photographs. I followed a number of dead ends, as well as being passed from person to person to track information and waiting to hear back from people. In some cases, I have email and snail mail conversations that carried on over two or three years. I had not done a project of this scope before, but my stop-and-go, zigzag method is common, I suppose, for a working writer. My favorite part was connecting with the nurses’ grown children, and, of course, meeting Retired Army Nurse Mildred Dalton Manning who was the last surviving POW nurse. She lived to be 98 and died a year ago this month. Once upon a time, when my husband was just a little guy, he believed that all doctors were women. That’s because his own mom was an MD. So it made perfect sense to him that this was how the world worked. But as we know, that’s not the way it was. Medical schools today are graduating women at roughly equal numbers as men. But there was time when simply the idea of a woman aspiring to be a doctor was laughable. 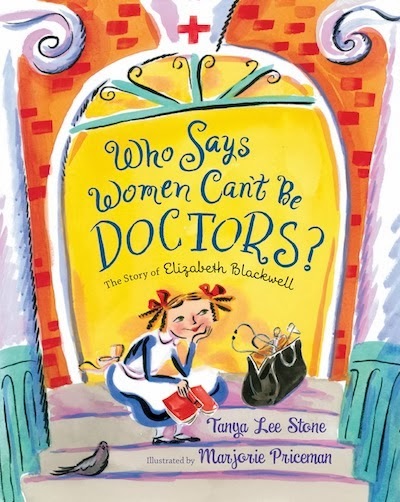 With the picture book Who Says Women Can’t Be Doctors? The Story of Elizabeth Blackwell (Henry Holt, 2013), Tanya Lee Stone takes readers back in time to see what it was like through a young girl’s eyes. Named a 2014 Amelia Bloomer Project book, Who Says shows what Elizabeth was like as a young, curious girl. And how she got the idea to become a doctor from a sick friend, who confided that she would rather be examined by a woman than a man. It lays out the challenges and frustrations Elizabeth encountered as she pursued her dream and opened the door for countless other women to pursue theirs. It’s a great book to celebrate Women’s History Month. Question: While you have written teen fiction, your specialty seems to be non-fiction. You are the author of at least 15 non-fiction books for young readers – including Courage Has No Color, The True Story of the Triple Nickles America’s First Black Paratroopers (Candlewick, 2013) – and 10 non-fiction picture books. What draws you to this genre? Were you been bitten by the research bug early in life? 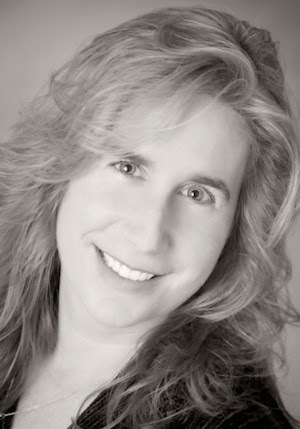 Tanya Lee Stone: I was an outdoor, tomboyish kid who loved to read and grew up on the rocky coastline of Connecticut, so I feel as though my entire childhood was based in field research! If you pair that with the fact that I am continually amazed by the extraordinary things that “ordinary” people do (there is really no such thing as an ordinary person), it’s easy to understand my attraction to non-fiction. Read more of this interview over at Kate Hannigan’s AuthorOf.blogspot.com, where you’ll find conversations with writers of some of the best books for children – from picture book to middle-grade, fiction and non-fiction. Picture book biographies are one of my favorite genres. Not only because they tend to feature remarkable people who change the world in one way or another, but because they distill the messiness of life into easily understandable bits. Betty wanted to fly, but people said a girl couldn’t, so Betty proved them wrong. Josephine wanted to dance, but America treated her poorly, so she found a place where she was loved and accepted. With The Noisy Paint Box: The Colors and Sounds of Kandinsky’s Abstract Art (Knopf, releasing tomorrow), Chicago-area author Barb Rosenstock tells the story of a young boy who opened his paint box and saw colors differently. Young Vasily Kandinsky could hear colors singing and see vibrant sounds dancing, and he didn’t want to paint the way everyone else was painting at the time. So he listened to his own voice and, over time, became a brilliant force for a whole new form of painting: abstract art. Beautifully illustrated by Mary GrandPre, best known as the artist for the Harry Potter books, The Noisy Paint Box has already garnered starred reviews from top journals, including this from Kirkus: “A rich, accomplished piece about a pioneer in the art world.” Barb’s other wonderfully detailed books have earned her praise as well: Thomas Jefferson Builds a Library, recently named an Orbis recommended book; The Camping Trip that Changed America, illustrated by Mordecai Gerstein; and Fearless: The Story of Racing Legend Louise Smith. Question: Your picture books cover pioneering stock car racer Louise Smith, a ground-breaking camping trip with President Theodore Roosevelt and conservationist John Muir, and Thomas Jefferson’s library. Now, with The Noisy Paint Box, you dive into the life of abstract artist Vasily Kandinsky. Where do your ideas come from? How do you go from “a-ha” moment when something catches your eye to finished manuscript? Barb Rosenstock: I wish I had a better answer than “my ideas are random” but “my ideas are random.” I wish they weren’t. Something I’ll read or see about a person or event will catch my imagination, and then it’s research time. I’m looking for its importance to kids or to curriculum and also for a focus to build a book around. How it goes to finished manuscript, well, like everyone else, it’s just create, revise, repeat.